Vittoriano Viganò 'VV Suspension' lamp in black and brass for Astep. Viganò was the art director of Arteluce, the company founded by his creative partner Gino Sarfatti, and the visor was one of his most celebrated design series. 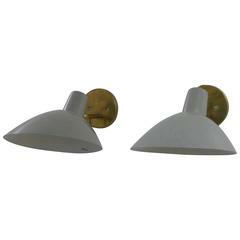 Designed in 1951 when Vigano, this is a professionally rewired authorized 2017 re-edition by Alessandro Sarfatti, grandson of Gino Sarfatti, who applies his grandfather's scrupulous attention to detail and materials to offer a tightly curated selection of iconic lighting originally produced by Arteluce. Professionally rewired for US electrical; as new, unused in original factory box. Executed in black enameled spun aluminum with brass frame, this suspension lamp features a distinctive dual-stemmed construction with two uniquely shaped reflectors, one narrow and one wide, that can be adjusted to many different positions, enabling a wide variety of both downward and upward lighting. A sculptural design with easy versatility. Price is per item. Also available in all black, red/black, white/black, yellow/blue/black/red and black/white/brass. In-stock lead time 3-4 weeks. Out of stock up to 10 weeks or more. Inventory availability subject to change. Not UL listed. Please note that these are unused new in box with professionally modified European wiring for US compatibility, but not under factory warranty. Made to order.